Guys! Guys! Guys! 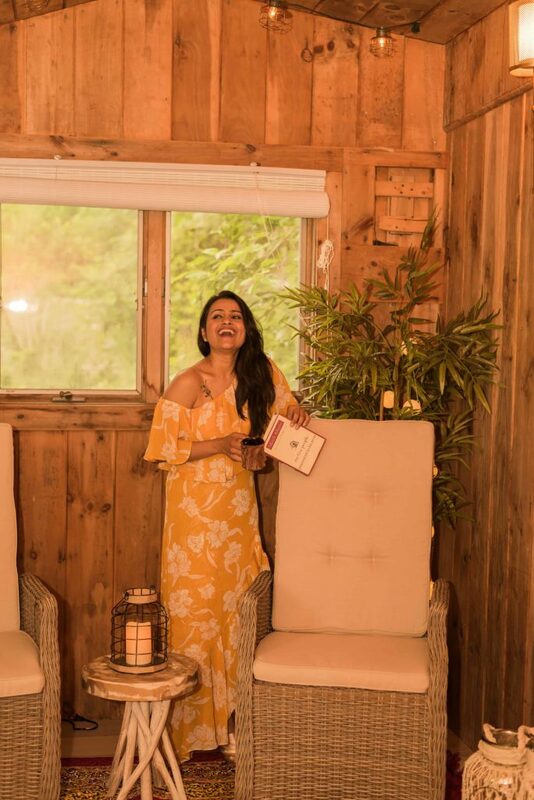 I am literally jumping with excitement as I write this post. It is midnight and I am actually sitting in this shed and typing. It is calming to sit here – I don’t believe I am saying this, but I have incense sticks burning and music playing in the background. I never do these things. It feels like vacation. Reminds me of the time when as kids we took a trip to Northern India ( close to the Himalayas ) and stayed at a log cabin. Or the first time, Amit and I went to Vermont and rented a cottage. 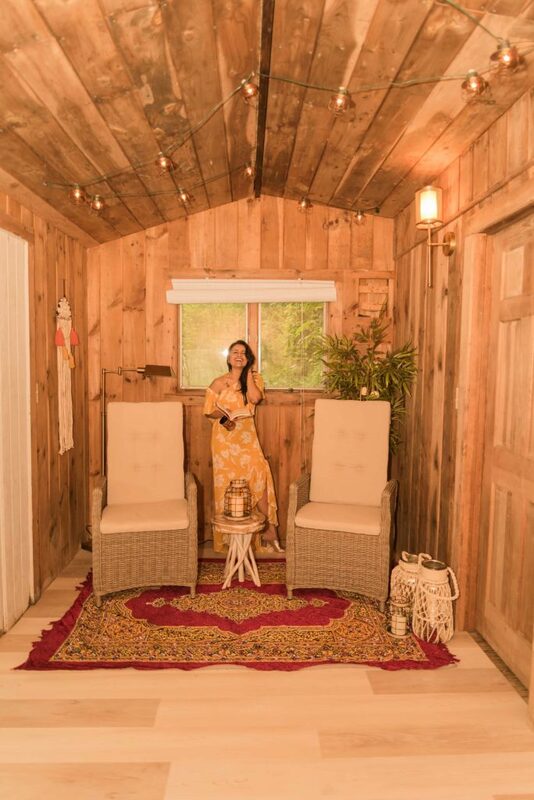 I am a city girl at heart – so if you take me to a rustic cabin – it is vacation! 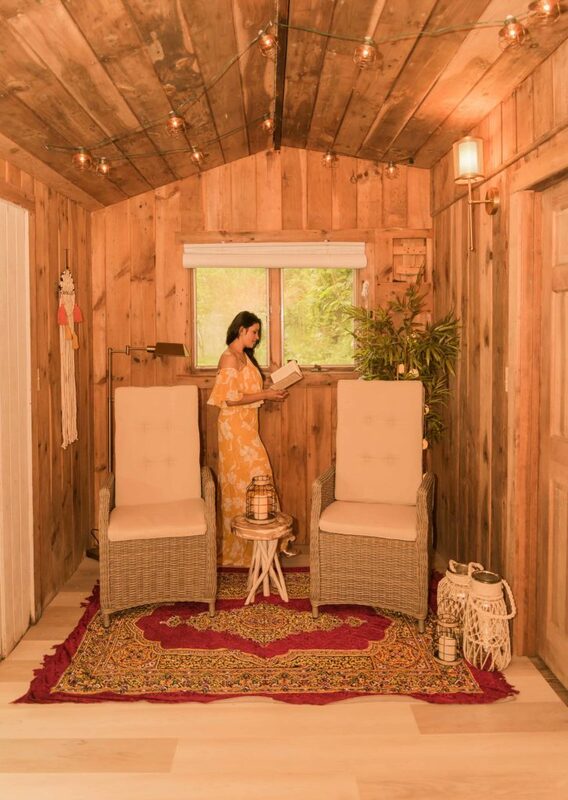 We converted our junk-filled, worn down, almost hopeless shed into an outdoor sanctuary. 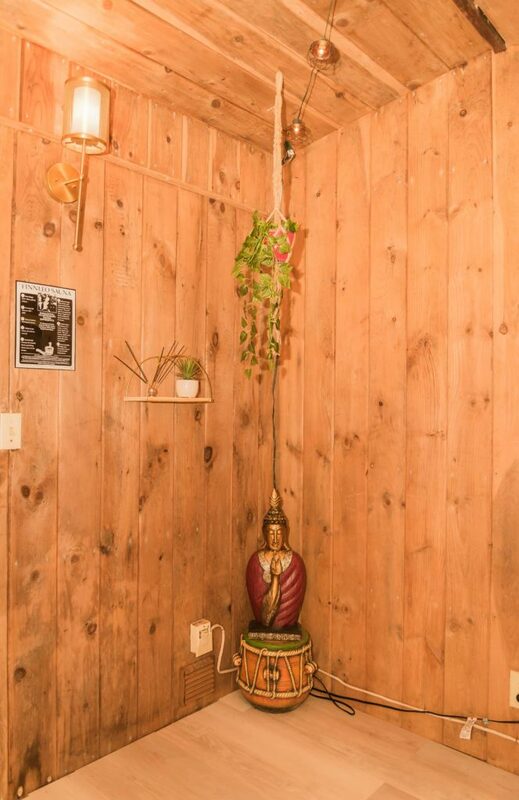 It is a tiny room space – like really small, but it feels like a getaway. 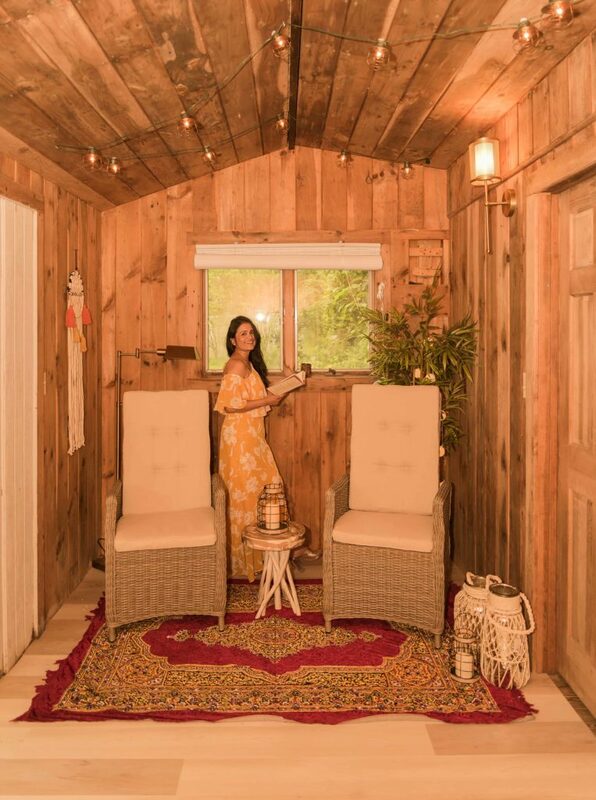 A backyard getaway – huh! I know I’ve already said this, but I am so excited. 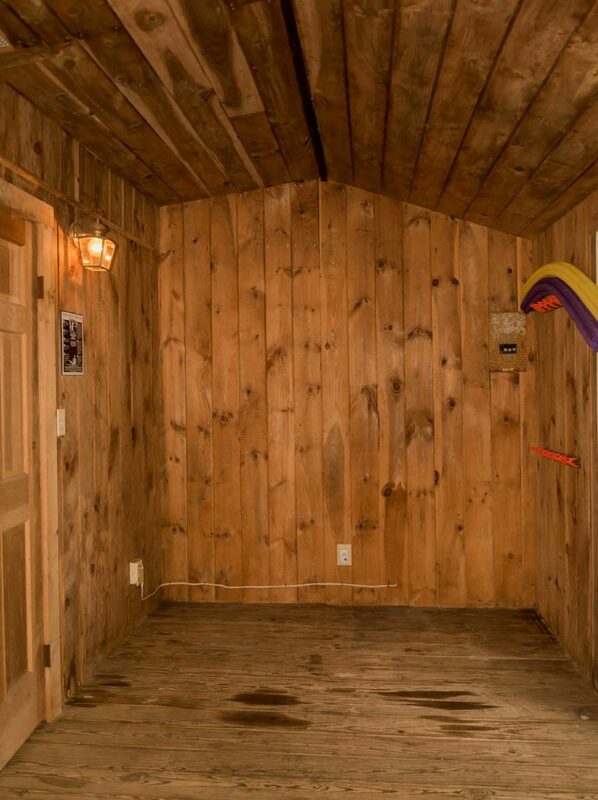 Basically, this shed came with the house and is technically a swimming-pool changing room/bathroom area. But slowly this box started getting filled with the lawn mover, yard tools, pool tools, our bikes, snow blower, cans and whatever junk you can think of. Even the bathroom was being unused because you just couldn’t get to it – there was so much stuff blocking the door. The original flooring was your typical wood planks but overtime had become discolored, rotten at the edges and gaps had started to form between the planks, it was falling apart! See the before images below. 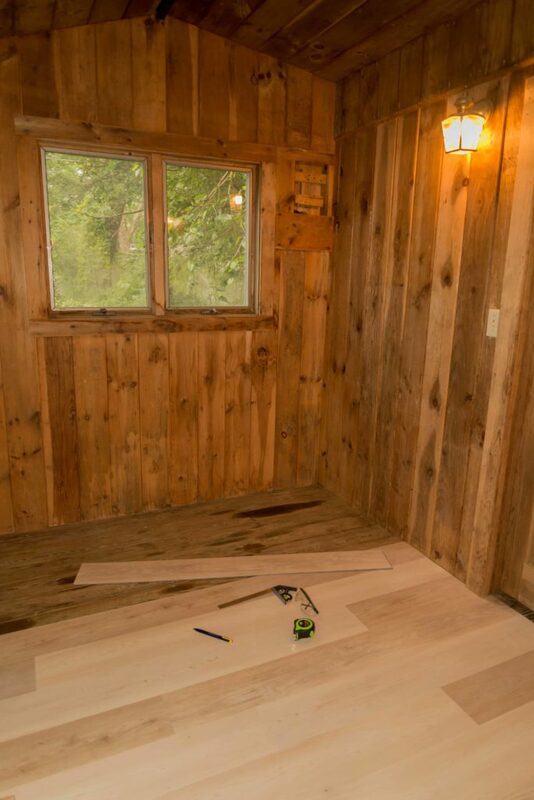 If we had to transform the shed, the first thing that had to be fixed was the flooring. It wasn’t as much an aesthetic requirement but moreover, a functional one. But if could get both – that would be perfect. These floors are 100% waterproof and easy to clean, which is a huge factor since there’ll be people coming out of the pool,yard brining in mud,water !I am so glad we were introduced to this flooring option and I couldn’t recommend it enough. It was quick, easy, non-messy, cost-effective and I love how the room looks fresh and new. 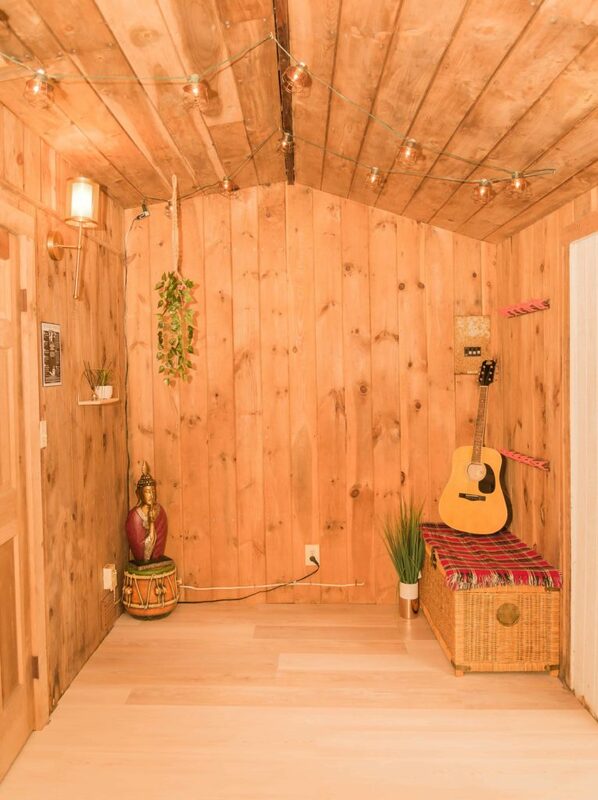 I wanted to convert this tiny space into a zen room. 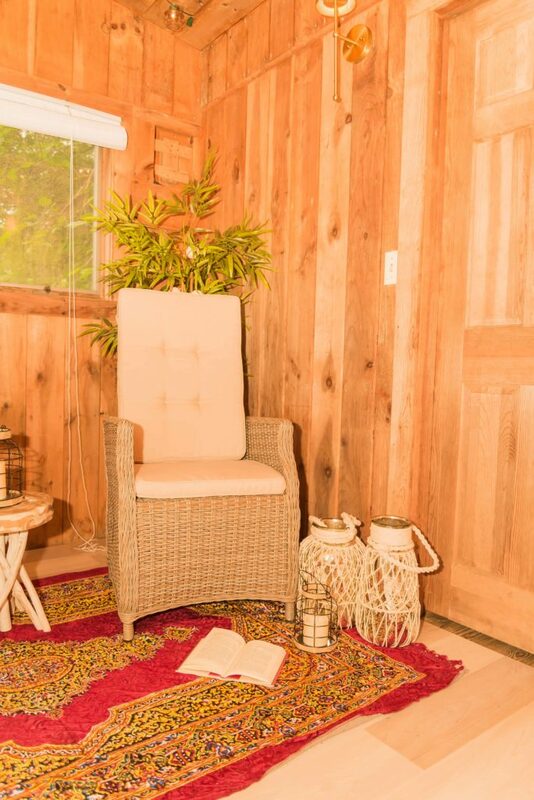 You can literally transform any space into a zen retreat – front patio, a spare room, a corner in your bedroom. 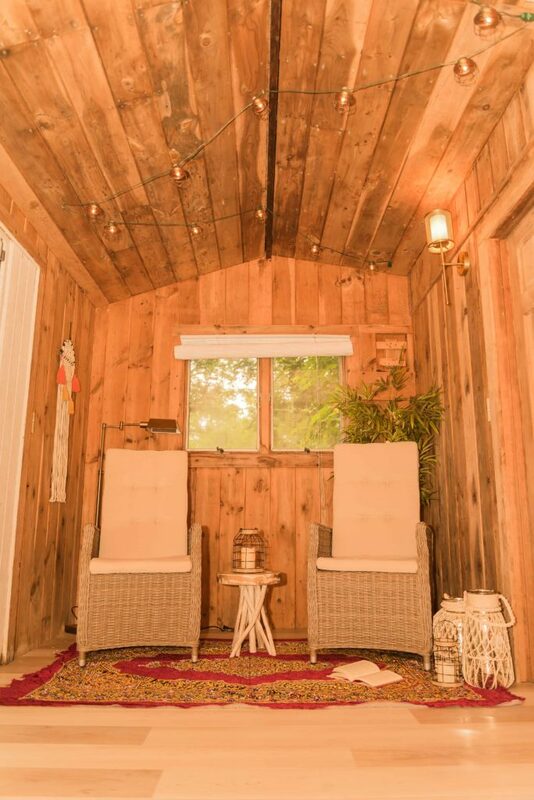 Just add some a cozy chair or soft pillows, incense sticks, peaceful music – and Na-ma-Stay! I am obsessed with the string lights from Lamps Plus – I seriously want to put string lights every where. It is a non-expensive and definite way to elevate the mood of the space. The scone lights add a touch of elegance to the rustic space. For the decor, I pretty much used pieces that I had in the house, collected over time. Also, see how a little greenery brings a little touch of the outdoors inside the room. A big thank you to Tarkett NA for partnering on this post. I can see the excitement on your pictures and contents!! 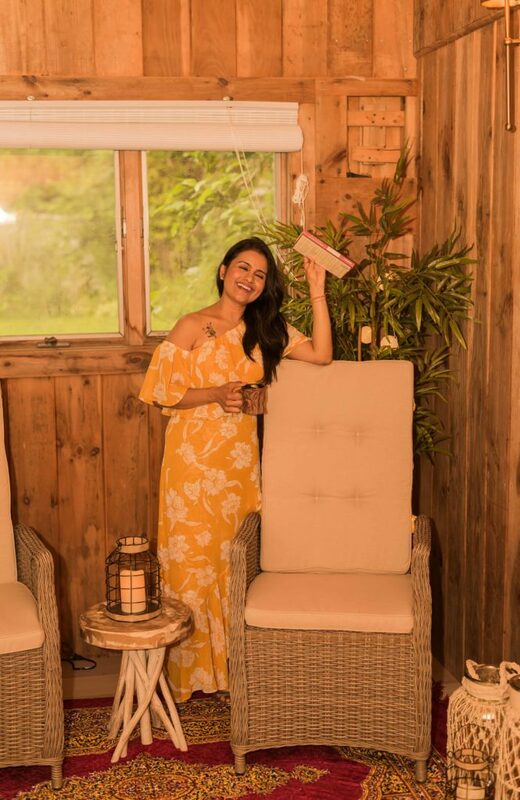 Love that yellow maxi dress and the house!! omg this place looks like a sanctuary!! THIS LOOKS AMAZIN, NEHA! Love little getaways! SO fun! Wow, this place is lovely! 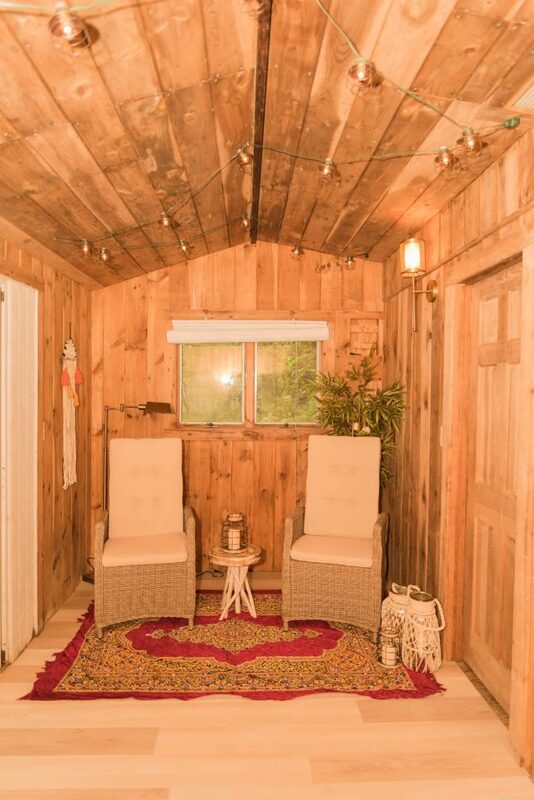 So warm, cozy, and truly inviting. Nicely done dear! Amazing photos! What a beautiful place! Thanks for sharing! Love the makeover! Looks like a ton of work went into it, but so worth it because it turned out beautiful!